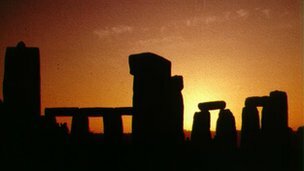 From the BBC Website: Two previously undiscovered pits have been found at Stonehenge which point to it once being used as a place of sun worship before the stones were erected. The pits are positioned on celestial alignment at the site and may have contained stones, posts or fires to mark the rising and setting of the sun. An international archaeological survey team found the pits as part of the Stonehenge Hidden Landscapes Project. Read more.